Institute of Technical Sciences of SASA and the PRIZMA D.O.O. company, Kragujevac signed a Memorandum on Business and Technical Cooperation related to the development and application of devices for atomization in the synthesis of nanostructured powders (http://dx.doi.org/10.1016/j.optmat.2012.06.019, http://dx.doi.org/10.1016/j.ceramint.2012.07.036). The signing of the Memorandum comes as a follow-up to several years long joint work aimed at successful implementation of atomization equipment in this process. On this occasion, the company PRIZMA D.O.O. 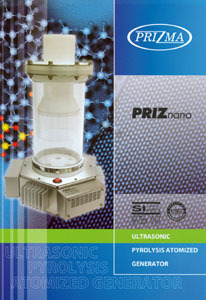 has also presented its latest PRIZnano device, which has enhanced features in terms of aerosol generation. PRIZnano will be used at the Institute of Technical Sciences of SASA in the synthesis of nanostructured powders through spray pyrolysis process.